I already made my hotel reservation. Are you going to mail anything out for registration? yes, a registration packet will be created and made available. Did you get my e-mail? I am looking for a packet. I already have motel reservations and plan on bringing my '59 Sea Lancer. Sorry, just checked my e-mail. thanks for the response. I will get it filled out and mailed. Rally registration forms are in the mail, finally. Well, I'm still mailing em a little at a time. Rally mailing FAIL. Apparently I did not have sufficient postage on the mailing. About 50 came back for more stamps. That means 150 to 200 are lost in the mail system. Soooooo, if you did NOT get one, please let me know ASAP and I will email or fax it to you (or send thru the mail). Been a while, but I am considering. How many boats and members do you expect? How many boats showed last time the event was held? I am not sure how many will show up. But pre-registration is dismal at best with only 6 signed up thus far. That does not include the 4 or 5 that I will bring. Two years ago there were 32 watercraft at the Rally. I hope there are a lot of last minute action. I have been to 4 out of the last 5 Rallys and have had a good time at all. The knowledge and friendship is always flowing freely. It doesn't matter the condition of what you bring, everyone there will appreciate what you have. If you are planning or are in the middle of a restoration, you will get as many pointers as you want. This a very knowledgeable group and are always willing to share. See you there!! I like to see works in progress as much as the finnished product. As much as I was hoping to bring a finnished boat, that will not be the case. I am trying my hardest to bring my project boat, which should create conversation. Wish me luck. The long range forecast is for mostly sunny and temps in mid to upper 70s Thursday thru Sunday - during the Rally. Yippee! 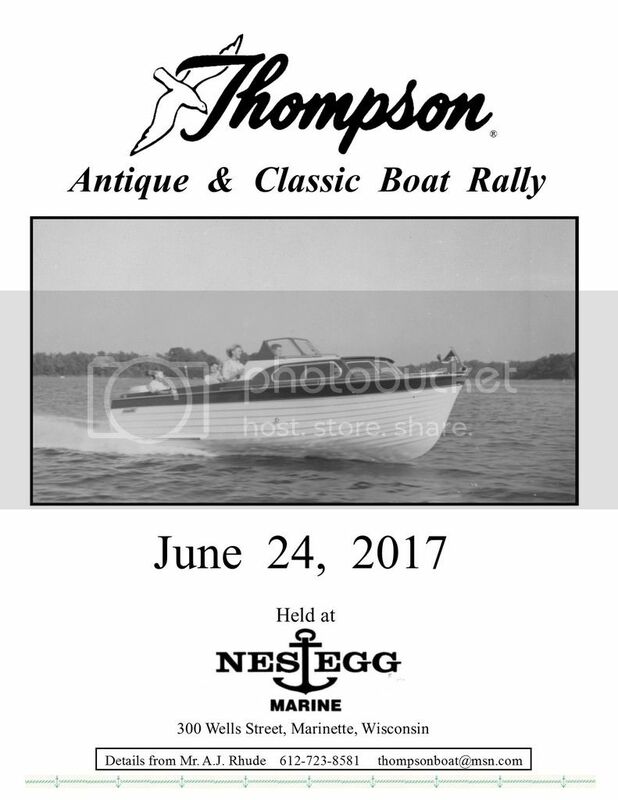 The flood did not damper the enthusiasm of the Thompson Boat Rally on 24 June 2017. It rained and rained and rained and rained and rained. And then it rained some more. There were 19 watercraft on display during some or all of the Rally - 15 Thompson, 2 T & T, 1 Barnes, and 1 Dunphy. The spectators were few and far between. Peter and Barb Thompson spent a couple hours with us. I saw at least three former Thompson boat workers at the Rally. The in-water boat parade was cancelled. We moved the picnic from the chilly and wet pavilion to my mom's house. All in all it was a good event and the die-hard classic boaters made a great day of it. Here's hoping for warm temps and clear skies for the next Rally in 2019. There are many photos already posted on facebook in several "Thompson Boat" pages.